Do you know what “The Fishing Fleet” was? We’re not talking about sou’westers and cod here. Beginning in the early nineteenth century, young Englishwomen who had trouble finding husbands at home often traveled to India in search of an eligible mate. And because of their enormous numerical advantage, girls who were overlooked on London dance floors could have their pick of suitors in Delhi or Calcutta or Simla. Anne de Courcy has written several solid biographies or group biographies, focusing on England’s upper classes in the last 150 years. She was, for example, Lord Snowdon’s official biographer. The Fishing Fleet is something of a departure in that it looks further back in time than most of her previous books but the hallmarks of her work are present here: thorough research, sympathetic narration, and a gift for explaining social context. For instance, I’ve always taken for granted the English presence in India, but de Courcy spells out precisely what the various services did, how they were staffed, and what life was like during the near-century of the British Raj. In 1861, the British population of India was around 125,000, about a third civilian and two-thirds attached to the armed forces. Of course India was crucial for British prosperity during this time, so the investment of manpower made sense. 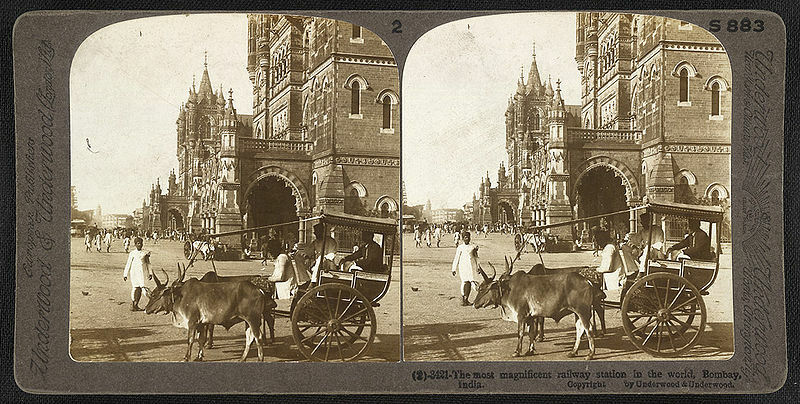 Stereoscopic view of Victoria Terminus, completed in 1888 in what was then Bombay. I’ve known about “the Fishing Fleet” for years; Joanna Trollope wrote a couple of good historical novels as Caroline Harvey that focus on Fishing Fleet characters. So I was thrilled to receive the paperback of this book from England, where it was a best seller. Everything was bigger and brighter in India, from the crowds to the natural settings to the colors of the clothes, the size of the insects, the maharajahs’ jewels, the houses, the distances, the military uniforms. The dangers, especially of illness, were greater, too. For women who married planters or men whose work took them “up country,” life was as harsh as for any American pioneer. And as de Courcy points out, the great grief at the heart of these marriages was that children were always sent back to England to be educated. Thousands of mothers put their five- to ten-year-old children on board ship, knowing they would not see them again for years. Some “Raj orphans” went to extended family but some were treated very badly indeed. Yet many returned to India, to perpetuate the cycle — and de Courcy helps us see why. This entry was posted in anglophilia, nonfiction and tagged Anne de Courcy; Joanna Trollope, British Raj, India. Bookmark the permalink. I agree with Judy! Adding immediately to my TBR list. As I read your review, “Old Filth” popped into my head twice; FILTI, Failed In London, Tried India? And of course dear old Filth was the most heartbreaking Raj orphan, wasn’t he? Thanks for finding another terrific future read. Yes, Barbara, Old Filth is very much a product of this world!